My newest flavor obsession is the sweet and savory combination of pineapple and teriyaki! 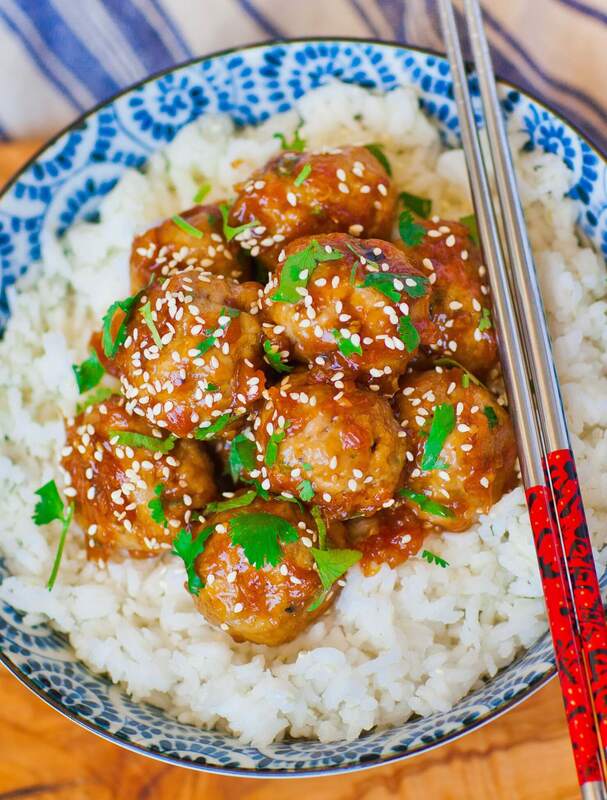 And these Hawaiian teriyaki meatballs don’t disappoint! If you’ve never had pineapple with meat, you’re in for a real treat! It goes so well with different meats and it’s especially delicious in this recipe. It’s not over-powering, making it that one ingredient that your guests will ask you about. These teriyaki meatballs can be made with any type of meat but I typically use ground pork or 85% lean beef. The extra fat makes these meatballs more flavorful and moist. The meat mixture is loaded with garlic and ginger, so you’ll have a good kick of flavor with every bite. Each meatball is fried, then coated in a pineapple, soy and ginger sauce that’s out-of-this-world delicious. This sauce is simply amazing! I wish I could bottle it up and eat it with everything! And the best part about this recipe, is that you can make it all in one pan! Serve the meatballs with steam white or brown rice, or your favorite noodles. These will also work well with fried rice! Prepare the meatball mixture. Combine the ground meat, seasonings and spices, egg and chives in a large bowl. Use your hands to knead the ingredients together. Add the bread crumbs last and mix just until combined. Use a scoop to measure out the meatballs, then round the meat with your hands into balls. Preheat a large frying pan and add a drizzle of olive oil. Fry the meatballs over medium heat, turning every minute until browned on all sides. Turn heat down to a medium-low, cover the pan with a lid and cook for about 10 minutes, or until meatballs are cooked all the way through. Remove the meatballs from the pan and set aside. Into the same pan, add water first to deglaze the pan. Then add the remaining sauce ingredients: soy sauce, brown sugar, sesame seed oil, garlic, ginger and pineapple. Bring the mixture to a simmer over medium heat and cook about 7 to 8 minutes, until garlic and pineapple is tender. In a small bowl, combine the cornstarch with 2 tablespoons of water. Add to the sauce and cook until thickened. Return the meatballs back into the pan and coat in the pineapple sauce. Sprinkle with sesame seeds and chopped cilantro. Serve over hot rice or noodles.